How do I Get Rid of Dust? Dust is a dirty word. We don’t like having it in our homes. Unfortunately, dust creeps in and never seems to go away. You can get rid of dust, however. In this article we’ll show you how. It walks in through the door on people’s feet. You can help get rid of dust by purchasing a walk-off mat. It’s a professional mat that you sometimes see in the entrances of stores. They’re available at a janitorial supply store. Get one for outside your door and one for directly inside your door. They’re available in a variety of colors and sizes. You can vacuum the mats regularly or shake them outside. You only need to hose the mats down and scrub with an all-purpose cleaner to get clean. Hang mats so they dry. You don’t want moisture to get trapped under the vinyl backing. Carpets can contribute to the accumulation of dust in your home. It settles on the carpets and it gets kicked up and spread all around your home. Consider replacing your carpeting with wood flooring. It doesn’t trap dust. Remove heavy drapes from your windows. Instead, put up lightweight blinds. They are easier to clean and you’ll see the dust accumulation sooner so you’ll be more apt to clean it before it gets out of control. You may also want to consider swapping out upholstered furniture for wood, vinyl or leather. Upholstered furniture traps dust much more often than these other types of furniture. You should use a vacuum with a HEPA-filter to ensure that you’re sucking up as much dust as possible. You can vacuum all the carpeting in your home, but pay special attention to the high traffic areas. You can also vacuum wood and other types of flooring. Vacuuming frequently cuts down on how much dust accumulates under furniture and in corners. Remember to change your vacuum filter frequently and keep your vacuum in good working order. Try to dust your home at least twice a week. Dust the tallest items in your home, then, work your way down. Going the opposite way will just track more of it around. Don’t forget to dust the top of your picture frames and your light fixtures. The baseboards also need special attention. You can use a damp rag or a glove. Ostrich feathers are especially good for dusting since their electric charge works on keeping dust on them as opposed to spreading it. Take your time and dust properly. Don’t skimp or go lightly. If you need an extra day to dust, do some on one day and more on another. It’s important. Every few days, you should sweep the floor with a broom and dustpan to get rid of the dust on floors you don’t vacuum. 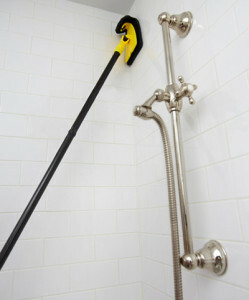 Sweep areas that tend to trap dust like doorways, hallways and the kitchen floor. Toss out the dust in your garbage can to make sure it doesn’t reenter the household. We’ve given you a pretty comprehensive list of how to get rid of dust in your home. We hope this helps. If not, you can always call use our online form to make an appointment. 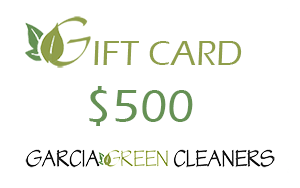 Garcia Green Cleaners would love to work with you in getting rid of dust in your home.